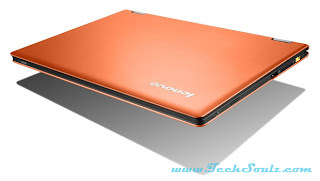 The 13-inch Lenovo IdeaPad Yoga, at first glance, looks like Lenovo’s first Ultrabook, the IdeaPad U300s. It’s slightly thicker and heavier at 16.9 mm and 1.54 kg, but it has the same attractive Folio design. What’s special about the Yoga is the ability to bend its display 360 degrees, thus converting itself into a (very big) tablet. 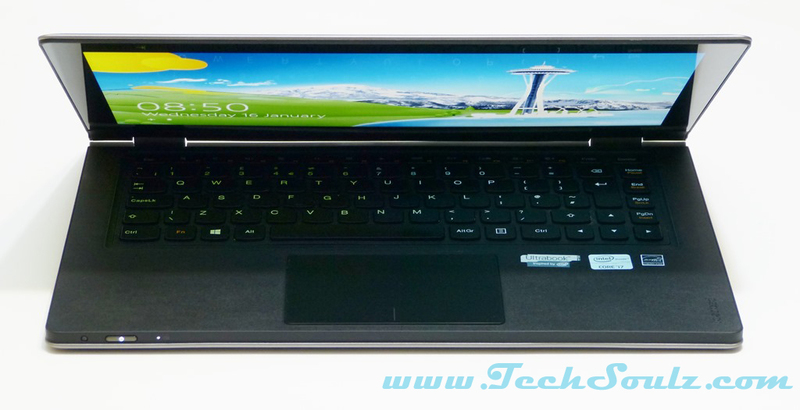 This is probably the most obvious, yet ingenious conversion method that we have seen thus far on a Windows 8-powered convertible Ultrabook. The Yoga is able to achieve this with patented hinges, giving it more flexibility than the other convertible Ultrabooks tested. On top of its regular laptop and tablet mode (elegantly held in place by magnets), the Yoga’s unique bending abilities give it two extra use modes – “Stand” and “Tent”. These two extra modes allow the machine to adapt to more usage scenarios. In “Stand” mode, the Yoga folds backwards about 250 degrees, resting on the backlit keyboard. This mode is good for usage that requires minimal interaction with the machine, as the hinges are not built to withstand poking and aggressive swiping without wobbling, even though they are fairly rigid by regular notebook standards. For interaction with the screen, there is always the “Tent” mode. The machine is flipped around, and now rests on its edges.This way, the screen is now able to withstand pokes and swipes as its now supported by the edge of the keyboard. Because the Yoga is supposed to be used in many different ways, it’s built to be quite sturdy. The metallic coating on the exterior of the machine is highly scratch-proof, allowing the Yoga to be placed in any of its modes and not pick up any scratches like machines made with aluminum would. 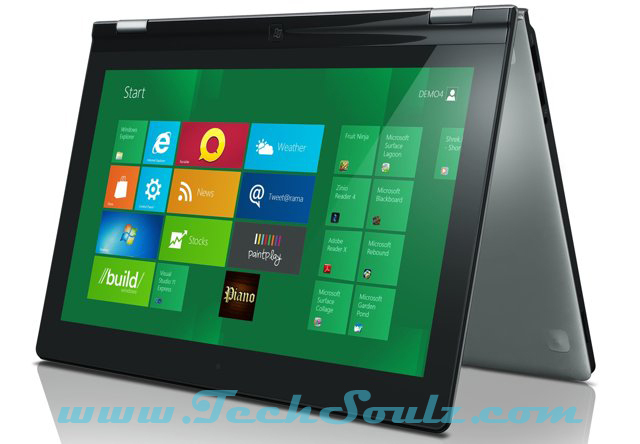 To make sure that the Yoga’s performance keeps up with its premium Ultrabook appearance, Lenovo threw in an Intel Core i5 CULV processor, 4GB RAM and a fast 128GB SSD. There is a different option for an Intel Core i7 processor and 256GB SSD, but that configuration will cost you a cool $2,099 instead. Another feature of the Yoga which we really like is the fairly sharp 1600 x 900 pixel resolution IPS panel. It’s not the highest resolution display in this Ultrabook lineup, but we found that it fits well on a 13-inch display, with the Windows 8 icons scaling nicely. Other components like an Accutype keyboard and big glass clickpad also play a major part in making the Yoga such a pleasure to use. Its chiclet-style keys have a good amount of travel and are springy, while its clickpad is responsive, with the glass on the clickpad also allowing your finger to slide effortlessly.